Ken’s musical journey began in the 1980’s when he taught himself to play the fiddle. The hammered dulcimer followed shortly thereafter. He is a founding member of the world folk music trio Helicon with Chris Norman and Robin Bullock. Born in 1990, Brad grew up around his father’s music. It was only a matter of time before he picked up an instrument. In the summer of 2007, Brad took an introductory banjo class at a music camp in Maine. He was instantly hooked. 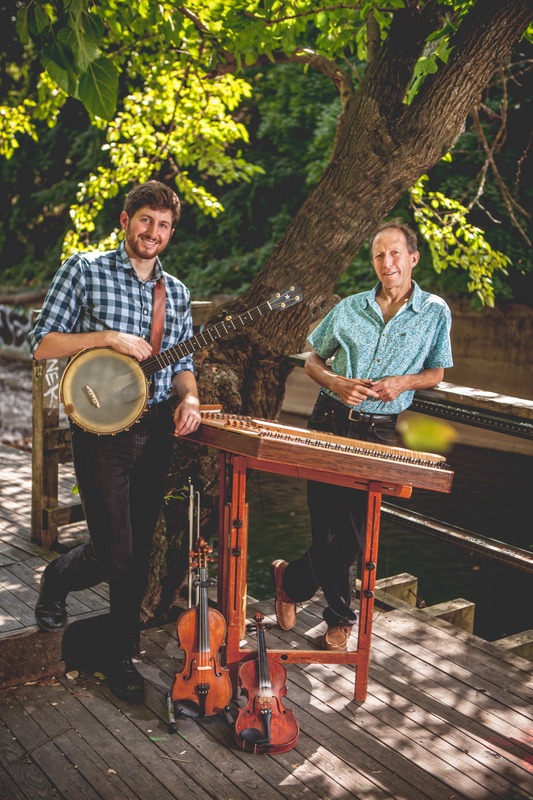 Ken & Brad initially expected they would focus primarily on the fiddle and banjo combination, the classic pairing in Old-Time music. They experimented with the hammered dulcimer and banjo pairing and recognized they were on the edge of a musical breakthrough. Ken & Brad are locked in from the second the mallet hits and the nail strikes the strings. They have a creative bond and danceable groove that is unmistakable. The duo started performing regularly in 2009. Two years later, they released their first recording, Otter Creek, which became the most played instrumental recording on the international Folk-DJ Radio charts. Brad’s original composition “Otter Creek” was the most played instrumental on the charts. Through performance and on the strength of Brad’s first recording, the recently named Strathmore Hall Artist In Resident and WAMU Bluegrass Country DJ has rapidly gained national recognition for his delicate touch and writing. Ken & Brad released Skipping Rocks, their second album, in September 2013. Their latest project “is both technically impressive and musically tasteful, a lovely exploration of both tradition and creativity (and of a warm musical relationship).” – Rick Anderson, CD Hotlist. Skipping Rocks debuted at #4 on the Folk-DJ Charts and in the top 20 on the Roots Music Charts. Among Ken Kolodner’s many credits are a featured solo in an Emmy-nominated CBS-TV Christmas special, over a dozen recordings with sales well over 150,000, an “Indie” winner for Best Seasonal Recording in 1999, a #1 World Music title (Walking Stones) and bestseller for BMG (with over 55,000 copies sold), and numerous books and instructional recordings (including a book/CD on old-time fiddling for Mel Bay and two recent books on arranging for the hammered dulcimer, also for Mel Bay). Ken toured with the world music trio Helicon for over a decade and continued to tour as a soloist. He was the first and remains the only U.S. player to be invited to play at the International Hackbrett Festival in Germany along with the world’s best players. His extensive repertoire of thousands of pieces includes the traditional music from over 30 countries on all continents. Ken has performed in every state in the U.S. and teaches locally in Baltimore with over 75 fiddle and hammered dulcimer students. His three week Sandbridge Dulcimer Retreats are attended by up to 60 players from all over the U.S. and beyond (www.sandbridgedulcimer.com). Music was not always in Ken’s vision. Kolodner graduated from Lawrence University in 1976 and a few years later pursued a career in public health, working on a PhD in epidemiology at The Johns Hopkins School of Public Health. While in grad school, he taught himself first to play the fiddle by listening to recordings. A few years later, he discovered the hammered dulcimer and quickly became recognized among a handful of the best in the U.S. Since completing his PhD at Hopkins, he has worked primarily as a musician (touring as many as 140 dates a year) but has continued to consult in public health, and has published widely with over 100 articles in medical journals. Brad didn’t start playing banjo until age 17 when he attended a music camp where his father was teaching. After just two years, Brad won the 2010 Takoma Park Old-Time Banjo festival winning a Kevin Enoch banjo and a performance spot at The Birchmere, sharing the stage with banjo legend Tony Trischka, Cathy Fink and Marcy Marxer, Adam Hurt and other notable banjo players. In 2012, Brad won first place in Old-Time Banjo at the prestigious Lowell Fiddle and Banjo Contest. In the summer of 2013, Brad won the inaugural Banjo Hangout National Clawhammer Banjo contest. His version of “Boatman” was the highest rated submission out of all 69 entrants. Most recently, Brad was a finalist at the prestigious Appalachian String Band Festival (Clifftop) for Old-Time Banjo. Brad guest-recorded on Out of the Wood, a 2011 release by Elke Baker (a Scottish National Fiddle Champion) and his father. Brad graduated from Ithaca College with a degree in Television/Radio in 2012. In the summer of 2013, Brad signed on as the host of “The Brad Kolodner Show” a weekly bluegrass show on WAMU’s Bluegrass Country, a 24/7 bluegrass radio station in Washington D.C. Brad has amassed a stable of over 30 banjo students in Baltimore. He has added fiddle, guitar and vocals to his repertoire. In addition to performing and teaching, Ken and Brad are avid supporters and developers of the Old- Time community in Baltimore. In the spring of 2013, Ken and Brad founded the wildly popular Baltimore Old Time Jam, a bi-weekly gathering of dozens of musicians and Old-Time music fans at Liam Flynn’s Ale House in the heart of Baltimore City. In November 2013, Brad spearheaded the launch of the bi-monthly Baltimore Square Dance at Mobtown Ballroom. The first two dances were packed with over 200 people at each dance. the finest, most able, and diverse hammered dulcimer player anywhere…. Brad Kolodner is simply one of the best of the new generation of Old Time melodic Clawhammer banjo players….